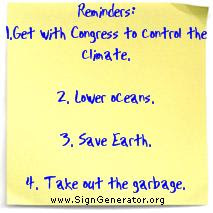 OR, How can a Congress which can't control Social Security spending control the climate? --— Sir John Houghton, first chairman of the Intergovernmental Panel on Climate Change (IPCC) and lead editor of its first three reports. Ahhh. The hubris of man. The United States for the first time outlined a dual path Wednesday toward cutting greenhouse gases that would involve both the Obama administration and Congress. Speaking at a U.N. climate conference in Copenhagen, Environmental Protection Agency Administrator Lisa Jackson described the EPA's decision that greenhouse gases should be regulated as complementary to U.S. legislation - not an effort to supplant the work of Congress. Why not just sacrifice a virgin or two? It would be as effective. According to the journal Science (Nov. 5, 1982), termites alone emit ten times more carbon dioxide than all the factories and automobiles in the world. Natural wetlands emit more greenhouse gases than all human activities combined. (If greenhouse warming is such a problem, why are we trying to save all the wetlands?) Geothermal activity in Yellowstone National Park emits ten times the carbon dioxide of a midsized coal-burning power plant, and volcanoes emit hundreds of times more. In fact, our atmosphere's composition is primarily the result of volcanic activity. To think that man can control the climate requires an almost arrogant belief in the abilities of man over nature. One would think that Greenies, who worship Nature as God, would understand that. When the EPA gets the emissions of volcanoes or termites under control, then they can come back and ask for permission to regulate something else.